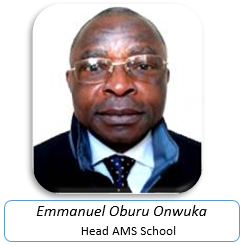 Emmanuel Oburu Onwuka attended Hocking Technical College; Nelsonwille, Ohio, USA; University of Wisconsin-Stout; Menomonie, Wisconsin, USA; Ahmadu Bello University, Zaria and Nigerian Defence Academy (NDA), Kaduna where he obtained series of Academic qualifications that prepared him to excel in every endeavor. He joined the services of NCAT in 1984 as ATE Instructor III and by dint of hardwork and dedication, he rose through the ranks to the enviable position of Chief ATE Instructor and Head, ATE School/member NCAT Management. He served in that capacity from 2000 to 2006. E.O. Onwuka is a licenced and rated professional Aviator with specialization in Air Navigation Systems Maintenance; a certified ICAO, TRAINAIR PLUS INSTRUCTOR; Author of the book, ((Introduction to Air Navigation Systems Management in Nigeria” Published in 2013, and a columnist to Aviation-line, a widely circulated and popular quarterly Aviation journal in Nigeria. He is a member of various professional bodies in Engineering, Aviation and Management fields. He is the current Head, Aviation Management School as well as a member of the Management of the Nigerian College of Aviation Technology (NCAT), Zaria. E. O. Onwuka has a deep-seated inclination to achieve result and has served creditably in various capacities in the developmental pursuits of NCAT. The Aviation Management School (AMS) was established in 2009 with a mandate to train,develop and equip aviation professionals at middle and top level management with managerial skills for performance enhancement on the job. The school offers specialized trainings in Air Transport Economics, Safety Management Systems, Aviation Passenger Services, Accident/Incident Investigation, Dangerous Goods, Human Resource Management, Office Management, Human Factors, and Basic/Advance Aviation Planning Operations and Management. Others include Higher National Diploma in Aviation Management (HND, AM) and Post Graduate Diploma in Aviation Management (PGDAM). These courses are accredited by NCAA, NBTE and AABI. Equip Aviation professionals with global managerial best-practices. To provide excellent and cost-effective high-quality management trainings designed to increase individual and organizational productivity in the Aviation industry.